Virtually all hearses built in the past 20 or so years have air suspensions, because dat ride, yo. 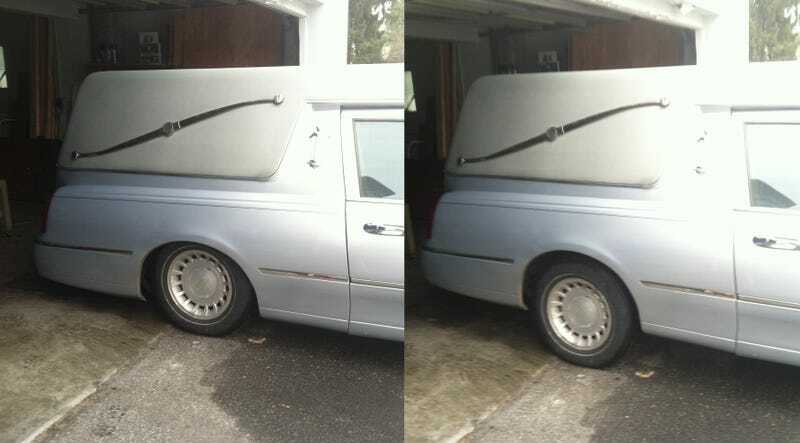 As an added feature of the suspension most have a button or switch in the back that allows you to lower the back of the hearse for easier loading. To lower the rear on ours you have to turn off the engine and hold a button inside the rear door on the right side. Dropping it the amount shown takes about 20 seconds. To raise it back up you start the car and let it do it's thing. Up, of course, is slower and takes about 45 seconds. It's a fantastic feature and makes it possible for a single person (usually me) to load a 350+ pound casket solo.